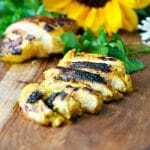 Light and crispy golden chicken made with a honey dijon sauce and a delicious turmeric flavor. It's healthy, easy and ready in only 20 minutes! In a small bowl, whisk together all of the marinade ingredients (honey through salt). Pour half the marinade into a large zip-top bag and add chicken to the bag. If time allows, place bag of chicken in the refrigerator to marinate for at least 2 hours. Set aside the reserved marinade to use as a dressing later. Heat a nonstick pan, grill pan, or outdoor grill over medium heat with about a teaspoon of oil and sear or grill chicken on each side until golden, crispy and cooked through (about 5 minutes per side for chicken thighs). Serve chicken with reserved sauce over salad, zucchini noodles, rice, pasta, or with a crusty piece of bread!